Jennifer Eremeeva takes on the ultimate culinary challenge: updating both the look and taste of two classic New Year salads. I can’t believe I’m actually doing this. I’m writing about two dishes that for me are the nadir of Russian cuisine: Salat Olivier and Herring Under Fur Coat. I never imagined I would ever make them, let alone recommend that anyone else do, and I’m well aware of the dangers of messing with two beloved Soviet classics, but I’m going to have a stab at it. Both could use some work. Both salads involve a lot of nit-picking kitchen prep of uninspiring ingredients, primarily boiled or tinned root vegetables. Neither dish is ever visually pleasing, mortared together as they are with lashings of synthetic mayonnaise. Herring Under Fur Coat is either an unappetizing shade of pink or yellow, depending on how the chef constructs the layers. Salat Olivier is both lumpy and beige. But both take center stage during the Russian New Year, and no Russian can imagine the holiday season without them. They are to Russians what Christmas pudding is to the British. So, in this final column of the year, I take up the ultimate culinary challenge: to make these two dishes both appetizing and visually appealing. To salvage Salat Olivier, I dived into the history books. Olivier was a Belgian chef, who worked at a fancy Moscow restaurant. The dressing of his famous salad was a jealously guarded secret, but contemporary accounts describe it as both spicy and tangy, and reference capers and parsley. P.P. Alexandrova-Ignatieva, in her 1909 cookbook “The Practical Basics of the Culinary Arts,” lists both grouse and crayfish in the ingredients, as well as cubes of aspic. These were my cues. I used duck and bacon instead of bland chicken, frozen peas instead of mushy tinned ones, and I layered the ingredients in a flavored aspic for an appealing presentation. 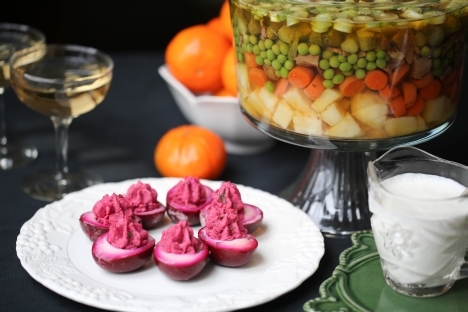 Herring Under Fur Coat is a Soviet riff on a basic beet salad, paired with salted herring, grated cheese, chopped hard-boiled eggs, and potatoes, layered with mayonnaise. I took these ingredients and simply arranged them in a different context: as a deviled egg appetizer, adding wasabi to spice up the herring/beet/egg yolk mixture and pickling the hard-boiled eggs in beet juice to create a charming purple hue to the eggs. Add tangerines and champagne and you have the start of a delicious New Year! 2. Slice the eggs in half. Place the yolks with the remainder of the ingredients in a food processor fitted with a steel blade. Process until smooth. 3. Spoon or use a pastry bag to pipe the mixture into the halved eggs. Chill for one hour. 1. Prepare the salad ingredients separately. 2. Layer the ingredients in a glass bowl or prepare a cake mold or ring by brushing it with olive oil. 3. Prepare the aspic: Proof the gelatin with 1 cup of cold chicken stock. Bring the chicken stock, wine, and Tabasco to a simmer. Add the mixture to the proofed gelatin and cool to room temperature. 4. Pour the gelatin mixture gently and slowly down the side of the mold or glass bowl. Refrigerate for at least four hours. 5. While the salad is chilling, prepare the sauce: Mash the garlic cloves and shallot and chop to a fine dice with one tsp of salt. Place the garlic with the mustard, egg yolks, and capers in a food processor fitted with a steel blade. Process until smooth, then slowly add the olive oil in a fine drizzle until the mixture thickens. 6. Taste and adjust seasoning with Tabasco, salt and pepper. 7. Add parsley just before serving. Pass the sauce to dress the salad. *Thanks to Kelly Senyi from “Just A Taste” for the inspired idea of pickling the hard-boiled eggs in beet juice. Jennifer Eremeeva is an American writer and longtime resident of Moscow. She is the creator of award-winning humor blog, Russia Lite, and The Moscovore about all things food in Moscow. Her first full-length book, Lenin Lives Next Door is scheduled for publication in January 2014.